Consolidation of the already existing information baseline and dataset, both at logistics (i.e. n. and category of shops in the reference area, n. and category of commercial vehicles circulating, n. and length of delivery trips, etc.) and environment level (city logistics related pollution terms of NOx, SOx, CO2, CO, PM, etc.). Consolidation of the user requirements, based on the results acquired so far with previous projects and activities in Lucca: the innovative logistics measures/services will be investigated in terms of needs from the Local Authorities perspectives and from the standpoints of the different stakeholders and user categories involved in city logistics processes. investigating in depth a few (3-5) real application cases that will be recognized as most similar to the context of Lucca area and related mobility policy. User needs analysis will be conducted, with the support of CSSF and with involvement of local stakeholders at the relevant institutional. 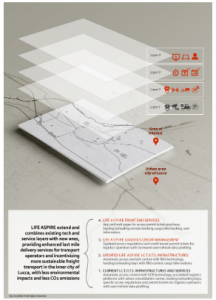 In action A.2, a range of normative and eco-sustainable city logistics measures/services and supporting ICT for freight distribution process will be specified and designed. The action is focused on the definition of an innovative “credit based” access control policy which awards or penalises transport operators on the basis of different logistics factors. with a modular approach in a way that they can be implemented independently.